Royal Mail Slogan Postmarks January 2018. Thanks to everybody who sent in examples of slogans received during 2017. I expect to see several related to new stamp issues this year including the RAF Centenary and Women's Suffrage. Doubtless there will also be various saint's days, Mother's Day, Booker Prize winner, Prince of Wales birthday, Royal Wedding (and baby), and Christmas. Time will tell. Nothing new to report yet, so I'm starting with one just received from Cornwall Mail Centre showing the default 'mental health awareness slogan, in the transposed position. Actually this is new but I included it in the end of the December reports with the other examples of Universal slogan usage. Lancashire & South Lakes unit 1 Remember to use the Post Code slogan on 2 Jan 2018 with 7 PM time. Times are unusual on Universals now, and cancellation of 2nd class mail didn't usual include the time, but funny things happen. 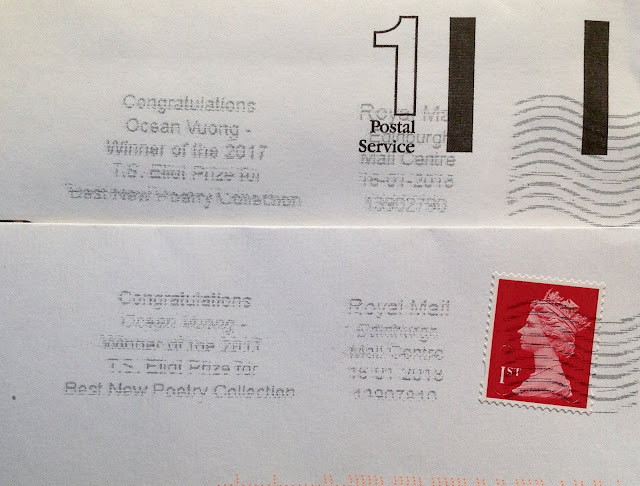 UPDATE 15 January: So we are half-way through January with only one new slogan postmark so far - and no news from Royal Mail as to why they have marked this one now. My thanks to JG for sending this example about the award of the Dickin Medal to Mali of the Royal Army Veterinary Corps, ‘For tireless bravery and devotion to duty during an operation in Afghanistan with the British Military in 2012’. However the medal was awarded on 17 November 2017, the exact anniversary of the founding of the People's Dispensary for Sick Animals (PDSA) in 1917. It can't be, as previously asserted, that Royal Mail have no special slogans in use during their Christmas 'campaign' because they broke that policy with the Nobel Prize slogan! UPDATE 16 January. Thanks to MB we have a good copy of the alternative layout from the other machines, this one from North West Midlands Mail Centre on 15 January. T.S. Eliot Poetry Prize. MB also sent two copies of the slogan which has replaced the PDSA one. Neither of these is a good example and both are from Edinburgh MC on 16 January. Ocean Vuong has won the 2017 TS Eliot Prize, for his debut collection Night Sky with Exit Wounds. The Vietnamese-born poet, who now lives in Massachusetts, has won a host of awards for the collection, including Whiting Award, the Thom Gunn Award, and the Forward Prize for Best First Collection. And thanks to DW for the other version of this one from Southampton Portsmouth & IOW Mail Centre. Thanks to peterh on Stampboards, I can show this example of January's Burns Night slogan running at Southampton Mail Centre a month later on 27/02/2018! I'm going to use this one to start the February blog tomorrow, as it is almost certainly in use all this week. By then we may have some better examples between us! South Midlands Mail Centre 29 January and Home Counties North MC 29 January. Update: Thanks to RW for a much better example with text on 5 lines, from Bristol Mail Centre on 30 January. Do you use pre-printed stamp albums?